Memorial Day weekend is upon us, which means it is officially summer (or something like that...) and that means BBQ season. Pies are the unofficial summer dessert (in my opinion) and what is better than pie? Galettes! Why? Because they are easy AF (as fudge) to bake. You don’t need any fancy pie weights or baking dishes. You can fill them with whatever your heart desires. They are absolutely delightful with vanilla ice cream on top. This recipe from Against All Grain is so easy and delicious and what I will be baking this weekend. Best of all, your little one can help! Now that you are all done getting pampered (or doing the pampering!) until next Mother’s day 😂, let’s get down to business. May is Better Speech and Hearing month! This year’s BSHM theme is Communication for All! As an Early Intervention provider, I truly believe that family and caregivers are the greatest language facilitators in the home. There are endless opportunities during daily routines to promote language development. In this blog post, I am going to give you a few easy ways you can start enhancing language development at home with your little one, regardless of their ability level, right now! Get on the floor and play! Be silly. Have fun! Children learn through play. Let them be silly, encourage them to explore toys and objects in different ways. Some children naturally know how to play with toys while other need models and assistance to play with toys appropriately. Narrate play and model verbal routines during daily routines. The more words your children hear, the more language they will absorb and commit to their receptive vocabulary. Use short sentences with salient language. Say the same specific words over and over. For example, “It’s bath time, let’s go take a bath, put the bubbles in the bath, the bath water is warm, dump the bucket in the bath, I love taking a bath!” and "I want to play with the blocks, put the blocks on, knock the blocks down, do you see the green block?" Read books together. It is recommended to read aloud at least 15 minutes a day. Reading aloud supports language development, literacy skills, brain development, bonding and engagement, and knowledge. You can do this anywhere, anytime, any age and at any stage. And best of all, you can join your local library and have an infinite number of books at your family's finger tips for free. Listen to your child. Follow your child’s lead. Joint attention is essential for your child to pair vocabulary with real life. If they are having difficulty attending to what you are doing, join in their activities and attend to what interests them. Model words that are engaging to them, use silly sounds and sing songs that they like to encourage joint attention. For additional information, please visit identifythesigns.org. Their "Communicating with Baby Toolkit" offers tips and milestone information for children from birth to age 5. If you feel your child has a receptive or expressive language delay or disorder, difficulty producing sounds, or trouble hearing or feeding, discuss with your Pediatrician to get a referral for a Speech and Language evaluation, Audiological evaluation, or feeding evaluation. The recommendations and suggestions on this blog are meant to provide enrichment to your child’s development and do not take the place of an individualized plan of treatment. So, you've waited last minute to get your mama, baby mama, or another special mama/mama-to-be in your life a gift. Don't get her flowers. They are pretty to look at and show you care for sure, but that's not what she needs. I've got some suggestions and Amazon Prime has 2-day shipping. This will be my first mother’s day as a mom. I can now truly appreciate how much blood, sweat and tears moms put into this gig. (All you mamas out there are magical freaking unicorns!) We never get a day off, let alone a few minutes to ourselves. We love it, but truth be told, we need some love and appreciation. I have been struggling with taking care of myself lately as I have been putting the baby, work and housework first. I am constantly aching, exhausted and generally look like and smell like poop. So here it goes, my mother's day gift guide for some truly deserving mamas you might know who could use a little extra loving, maybe even yourself! This Kindred Bravely nightgown/dress in black - whether she plans on breastfeeding or not, she will LOVE this dress. It is buttery soft and the fit is amazing postpartum and beyond. I brought mine to the hospital and I pretty much lived in it for months. In black, it works as a day dress also! Klean Kanteen water bottle - this guy will keep beverages cold or hot for extended periods of time, which will come in handy for not only all the water she will be CHUGGING, but also for all the hot coffee she won't want to reheat 30x a day. Lotion, cream, body oil - my favorite when I was pregnant was Zoe Organics belly oil and Mama Mio belly butter. Vava Nightlight - This one or this one. These little guys require very gentle touch to turn on, dim, brighten or turn off. Great for the nursery, bedside, couch-side, travel or wherever you are trying to get the baby to sleep. Also great for reading in bed. Zoe Organics Everything Balm - I have 3 of these on rotation right now - diaper bag, handbag, night table. It does literally EVERYTHING. It's my favorite lip balm and cuticle balm in one. It was a simple luxury for me when I was recovering at the hospital after my c-section. Revlon Salon One-Step Blowdryer - this is seriously a game-changer. My baby takes 20 minute naps, and this thing blows my hair straight in exactly 12 minutes. That leaves me 8 minutes to shower and throw on clothes. I can't say enough great things about this. I have fine, silky hair but have heard great things from other women with different hair types. It's basically like getting a blowout at home. Before I got this 2-weeks ago, I literally blow-dried my hair 3 times in the past 10 months. Amope Pedi Foot File - because who knows when she will actually get to go to the nail salon for a pedicure, which leads me to another great gift...offer to babysit for an afternoon so she can go get a pedicure! A super soft cardigan - because she needs a good hug. Gift card to her favorite clothing store. Drunk Elephant skin care - This line helped my skin remarkably. I suffer from hormonal acne and hyper-pigmentation. It helps keep my skin fresh and as clear as possible. The packaging makes it feel like a treat, but it works better than any prescription I have ever used! A few hours off - I love spending every waking moment with my baby when I am not working. I don’t leave her to do anything besides work. And I think this is part of why I am burning out. I need some time to myself. A few hours to go to a yoga class, get a manicure or a haircut, or go shopping without a diaper bag, stroller and (an occasional whining) baby would be a real treat. A gift card for a cleaning service to clean the house! Diffuser and essential oils or roller essential oils - I am a big fan of the brand Saje. Their oil blends are heavenly. Visit my Pinterest page for more homemade gifts from the kids! At the end of the day, it really isn't about the gift. It's about the thought behind it. If you can write up a thoughtful message, help her with some housework and give her time to go take a shower and a nap, I'm sure she will have the best mother's day ever. Hello dear readers! Thank you for sticking with me. Hope your new year is off to a great start and that you are all doing well! It has been quite some time since my last post and a lot has happened since then. 41 weeks of pregnancy and 6 months of motherhood and here I am. I have my very own little and she fills my world with joy. This past year has been an adventure like no other. Margalit was born on July 11. Her name is Hebrew for Pearl. She loves to be read to, laughing at Mommy and Daddy, listening to music, playing with other children, eating purees and petting her dog, Charlie. She is a happy, loving little girl. We are incredibly grateful to be her parents. I was extremely fortunate to be able to take some time off from work and dedicate my time completely to this little person. I started working again about 3 months postpartum and I am learning how to manage her schedule and mine. I look forward to blogging again and sharing some of our personal adventures, too. The crisp morning air is finally here, the leaves are starting to fall and school is back in session. The autumn is my favorite time of year. sorting apples, pumpkins, acorns, leaves - if you can't get to a pick-your-own to get some apples and pumpkins, you can go outside and collect leaves, pinecones, and acorns and you can work on size differences, colors, and object identification. glueing leaves - cut out some leaves out of construction paper in different colors and sizes, draw a tree trunk and some branches on a piece of paper, assist your little one with dotting glue on the paper, then give your child choice of 2 different leaves as he/she glues them onto the paper. pumpkin painting - grab a paintbrush and some paint and go to town on a pumpkin, you can suggest to make faces, draw shapes, make polka dots, write their name on it, whatever your little one's heart desires. make a thumbprint pumpkin patch - you can use a washable ink stamp pad or finger paint and help your little to dip their thumb into the ink/paint, then push it onto the paper and repeat. Once dry, you can draw the leaves, vines, stems and even faces on the pumpkins. Attribute Apples - I love this toy. Made by Learning Resources. It does contain small pieces that present a choking hazard, so please use with caution and supervision. There are so many ways you can play with this game with your toddler. Identifying colors by name - hold up 2 different color apples - instruct your child to, "Find the (color) apple." Identifying size differences - hold up 2 different sized apples (in beginning, it is most helpful to use apples of the same color) - instruct your child to, "Find the (big/small) apple." As your child identifies size difference and color with increased accuracy, you can make the activity a little bit harder by introducing more apples for them to choose from, in other words increase the amount of apples you lay out for them to choose from. And once they get really good, work on 2-part instruction with 6 different apples (big yellow, small yellow, big red, small red, big green, small green), and instruct him/her to, "Find the big yellow apple." Then you can make it even more challenging by adding a direction onto that, for example, " Put the big red apple on the table," or "Go give the little green apple to Mommy." You can also get creative and hide the apples in a sensory bin filled with beans, rice or sand. These are also very easy to clean. Harvest Chicken Skillet - with brussel sprouts, apples, sweet potatoes and bacon, this satisying recipe has wonderful fall flavors and makes a big batch perfect for leftovers. Turkey Meatloaf - my friend Jen over at Hauling in Heels shared this recipe with me and it is delicious! I used BBQ sauce instead of Worcester and beef broth in place of the milk. Make it once and have leftovers for days. Apple Cider Glazed Doughnuts - click through magazine (free) for recipe, you won't be disappointed. If you don't have coconut butter (or read the recipe before you begin, which I am guilty of), you can put shredded coconut in vitamix/blendtec food processor and pulse for a while until its a creamy consistency. These have a really nice texture and are not overly sweet. I used brown sugar in place of coconut sugar, due to my own preference. What are some of your favorite fall activities and recipes? This cantaloupe and cucumber salad is so refreshing and easy on the GI tract as it adheres to a Low FODMAP diet. It is easy to put together for an afternoon snack or bring to your next BBQ. Recipe adapted from Beyond the Bite. I adjusted the recipe to add more cucumber to make the cucumber:cantaloupe ratio 1:1. Cut the cantaloupe in half, scrape out the seeds, shave the skin off, and cut into 1/4 inch cube sized chunks. Peel cucumber, cut in half, then cut into further slices, and chop the slices into 1/4 inch cube-sized chunks similar to that of the cantaloupe. Lightly chop the cilantro leaves, juice the limes, chop the green onion into small slivers, and place all of the items in a large mixing bowl. Mix in sea salt and avocado oil to the bowl. Add in chopped cantaloupe and cucumber, tossing until the ingredients are evenly incorporated with each other. Hope you like it! Thank you Beyond the Bite for a delicious addition to our summer menu! During the bone-chilling winter months, we swore we wouldn't complain about the heat during the summer. But heck, it's been hot outside. Unbearably hot. And I find myself daydreaming about cool fall nights. 1. A water-play station. You can set up your own and use just about any bucket or container you have and fill it with water. Add in cups, measuring spoons, funnels. You can also add in some rubber ducks or toy boats for some pretend play. Always remember to refresh the water with each use. Bonus tip: add in some soapy suds to clean toys and get your little one to participate in the fun of household chores! You can also work on wiping them down with a towel after their toy bath, which reinforces sequencing. 2. Paint with water. Fill up a bucket with water. Get some chunky paint brushes and go to town on the driveway or sidewalk. Again, you can talk about and work on sequencing, "first dip the paintbrush in the water, then you can paint on the sidewalk". 3. Ice cubes. Lots of ice cubes. In all shapes. Sometimes in the form of ice pops. These are great for oral and tactile sensory input - meaning they can help wake up feeling, soothe too much feeling, or bring awareness to feeling in body parts like the finger tips, tongue and lips. Some children may be extremely sensitive to the cold and thats OK. They may not like the ice and may not be able to tolerate it. Try to allow your littles to explore on their terms, and it also helps to allow themto explore first with their hands before their face. 4. Sprinklers! What better way to bring your lawn back to life and keep cool at the same time! There are also some really neat sprinkler parks in NJ. 5. Tea party! Bring out some cups, bowls, etc. and some fresh drinking water. Have a tea party, lemonade party, ice cream party. Great to practice imaginative play, turn-taking, and sharing. 6. When all else fails, hit up the grocery store, mall, movie theater, and other local indoor attractions to get a fresh blast of air conditioning! How do you stay cool in the summer? Please comment below or tag #lunchwithlittles on Facebook and Instagram. 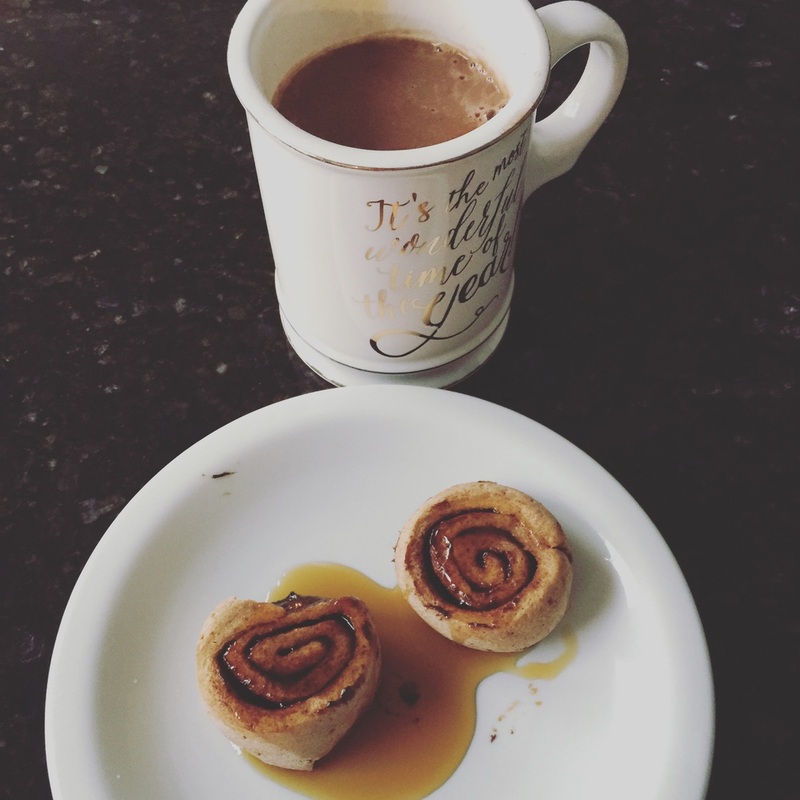 I found this recipe over at Elana's Pantry for paleo mini bagels (I prefer to call them "baby bagels") and had to give them a try. I love "everything bagels", so having to eat gluten-free the past 6 years, I have been missing them. These are a great substitute for those who want to eat healthier or who have to be gluten- and dairy-free and are loaded with protein (check out the link for nutritional facts). They are also kosher for Passover. Spray down the pan with a little coconut or olive oil. Add a pinch of sea salt in with the poppy and sesame seeds and onion flakes. These bagels are very easy to make and all you need is a food processor and mini muffin or donut pans. The small size makes these perfect for snacking. I ate them with smushed avocado inside to keep me energized in between power-packing for our big move. Always consider the ingredients before making for your toddlers and always ask your pediatrician before introducing new foods to your little one's diet. These bagels are made with eggs, almond and coconut flour, sesame seeds and flaxmeal so please be aware of allergy risks. What is your favorite type of bagel? What are your favorite bagel fillings? Hope you all have a nice weekend and Happy Easter to all those who celebrate. 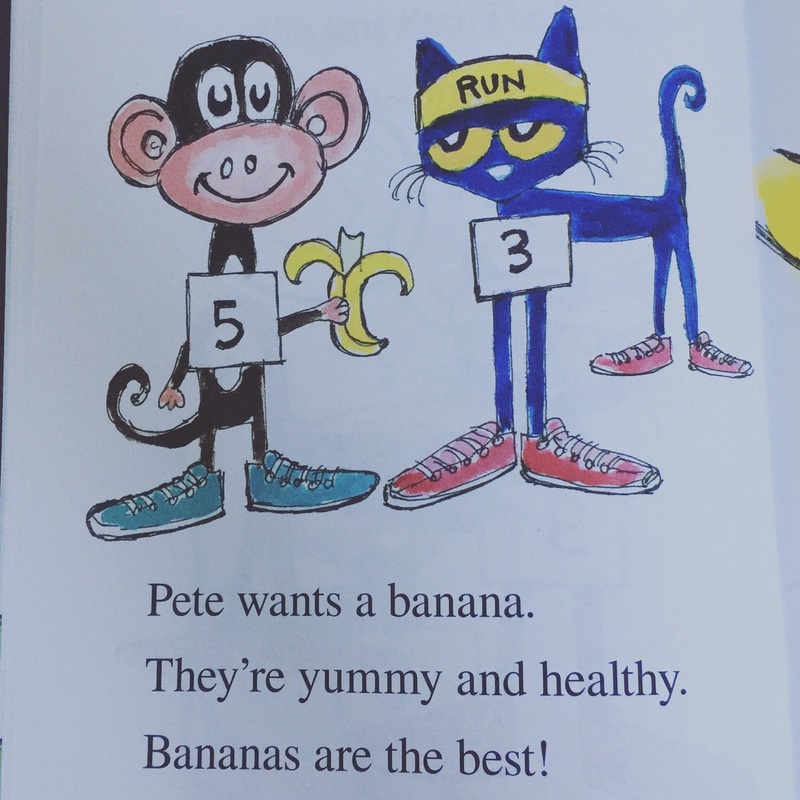 Pete the Cat and the Bad Banana book and activities. One of my favorite books is Pete the Cat and the Bad Banana. The auditory bombardment of the word banana makes my heart jump for joy. Disclaimer: I am Pete the Cat superfan. The books read so easy and most of them are quite repetetive which is perfect for teaching toddlers new concepts and words and practicing those words. You can instruct your little to point to the bananas all throughout the book as you read. Exaggerate each syllable slowly and silly. Use props and match the foods to the pages of the book. I have play food for banana, lemon, pickle and orange. This enhances the reading activity to make it hands-on. 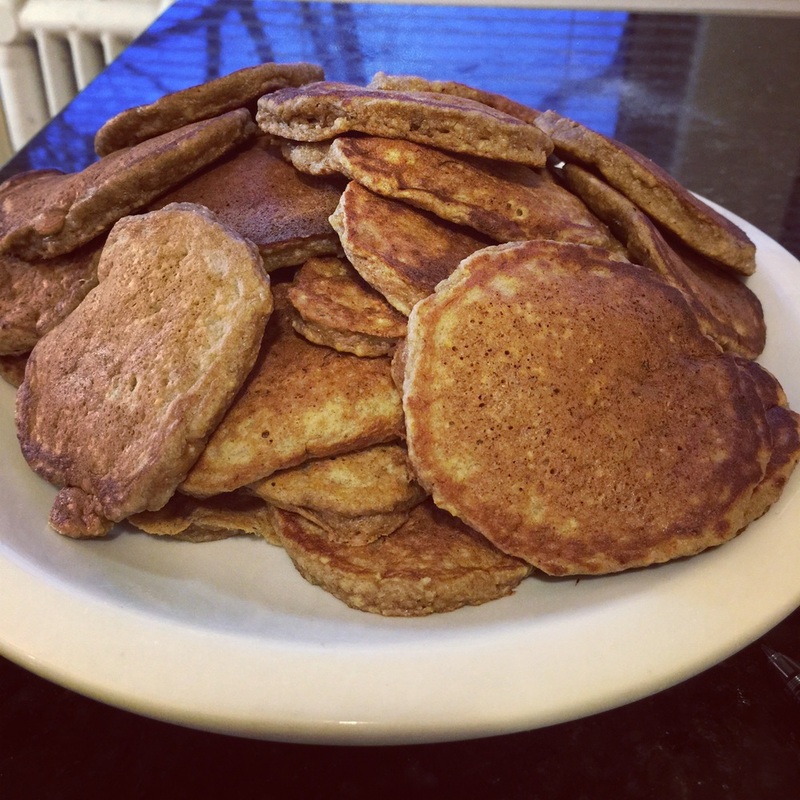 Make banana pancakes! These are my absolute favorite and mashing the bananas with a potato masher is fun for littles (adults too, it releases stress!). I made this handout to color the different foods Pete tries. (Click the link to download the PDF and print) You can use this a number of ways. Younger littles can just color it and point to the different foods. You can give instructions to older littles to circle, color in and cross out with a specific color dependent upon their pre-writing development. For example, "circle the bananas with a yellow marker", or "color the pickles green." What are your favorite banana recipes? Whats your favorite Pete the Cat book? Share your favorites in the comments or with hashtag #lunchwithlittles ! Tomorrow is Friday. Treat yourself. You deserve it. I made pretzel marshmallow treats. I simply subbed in pretzels in my favorite rice krispies treat recipe. Amazingly salty and sweet. Don't worry, I balanced them out with brussel sprouts. What will you treat yourself with? To say Valentine's day is my favorite holiday is an understatement. I love crafting and making my friends feel special. I love the idea of little mailboxes on school desks and making cards for classmates. I don't think of it as a romantic holiday. I think of it as a holiday to spread your love around to all your friends. Some people call it "Palentine's" or "Galentine's" Day. I may even be guilty of using those words. 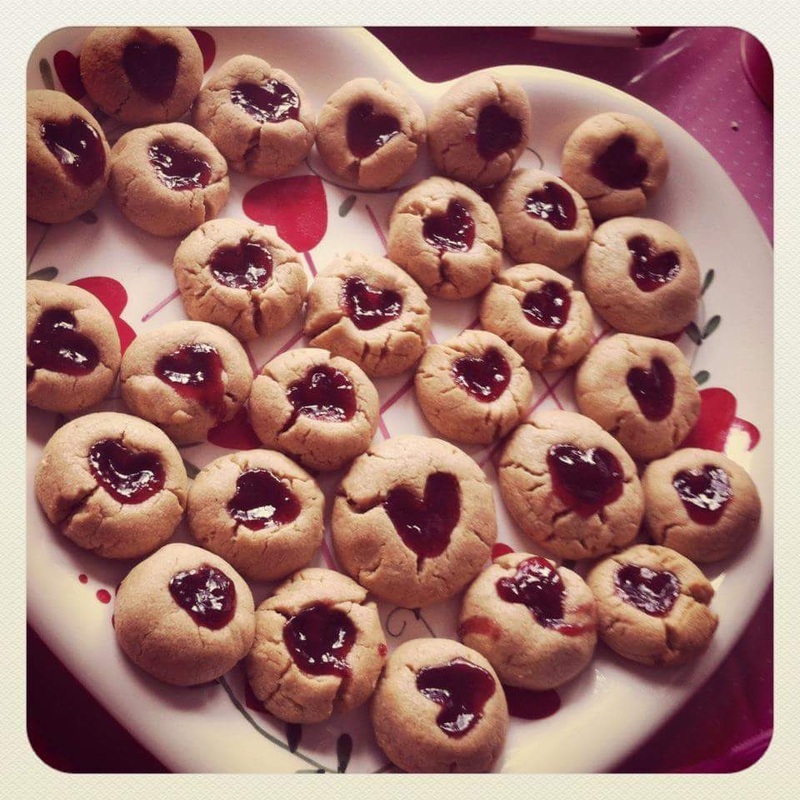 Hope you all have a great Valentine's Day and enjoy this blog post and some of these activities with your little ones! Cut up decorative straws to make beads. Sort hearts - you can cut out hearts in different colors and sizes and sort them, match them, etc. Remember to talk about the activities as you do them and leave time for your little to chime in too. As always, consult your pediatrician prior to introducing new foods and observe safety precautions and with small objects to avoid choking risk. Hi Everyone! Hope you are all enjoying the snow storm and keeping warm! I made this chicken avocado lime soup a few days ago and was fortunate to have some leftover for today. It was very easy to throw together and is very filling. I cut up strips on corn tortillas and baked them for about 10 minutes to throw into the soup. It was comforting and delicious. Enjoy! What are your favorite snow day activities to keep your toddlers busy? Share them in the comments or tag your pics with #lunchwithlittles ! If you haven't sworn off sugar as part of your new year's resolutions, these hot cocoa cookies are the best cookies in the world. Best eaten slightly warmed up so when you bite into them warm chocolate oozes out from inside the cookie and marshmallow. They are time consuming to bake, but I promise well worth the effort. I have subbed in gluten free and dairy free alternatives without compromising the recipe with exact exchange. I use the giant bars of dark chocolate they sell at Trader Joes and measure with a kitchen scale. These cookies are a sure-fire crowd pleaser, perfect for a party or a cold night cuddling on the couch with your littles. Happy New Year! Hope you all had a wonderful holiday season and enjoyed some quality time with your friends and family, as I have. I have so much to be grateful for and would like to extend my gratitude to all of you for sticking with this blog as I took a brief hiatus. It is my goal, with this new year, to work on this blog more, so please stay tuned! I am very excited for what this year will bring! Sifting the homemade oat flour, the key to smooth (no lump) crepes. Happy Sunday! It's been rainy and cold here in NJ. I've been home resting and staying warm and dry trying to kick a cold. 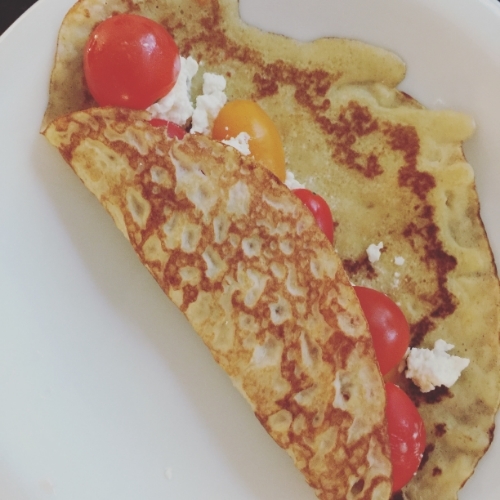 I found this crepe recipe over at Naturally Ella and immediately had to give a try. I have adapted it to be gluten- and dairy-free. There is so much you can do with a crepe and your little ones can have a blast filling them! Sift the flour then combine all ingredients and mix well with whisk. Heat an 8 inch skillet and lightly grease (I sprayed with coconut oil). Pour 1/4 cup of batter onto pan and gently (and quickly) tilt the pan in a round motion (it's all in the wrist) to spread the batter to make a big circle. Cook for 30-45 seconds until it easily comes up with a spatula then flip and cook other side for 15 seconds. Put in on a plate and eat it with whatever filling make you happy. You can stack them on a plate to cool, just remember to overlap and not put the directly on top of one another or else they will get a little soggy. Once the crepes are cooked, the possibilities are endless. Use your imagination and you can allow your littles to get creative with what to fill their crepes with. Cheeses, veggies, fruits, jellies, chocolate chips, whipped cream, nut butters, the list goes on. Make it simpler (and more palatable) by giving them a few options that would go well together. You can put the ingredients in small, pinch bowls and allow them to take artistic liberties decorating their delicious crepes. I made a crepe/nutella cake by layering the two components. You can do this too to talk about sequencing and patterns, say "What comes next?" Deliciously Ella has a great Vegan Nutella recipe in her cookbook and it tastes delicious layered between these crepes! Place hazelnuts on a baking sheet and bake for 10 minutes, then remove from oven and cool. Once cool, put the hazelnuts in a very strong food processor (I use a BlendTec), blend for about 10 minutes until the hazelnuts completely break down. Add in the maple syrup and cacao powder then blend until completely incorporated. Gradually pour in the water and blend until fully incorporated. Eat, store in fridge and enjoy! A fun way to promote early literacy skills and encourage sound production is to play with letters. One of my favorite books is Chicka Chicka Boom Boom. It brings little's awareness to the letters of the alphabet and is fun to read. The activity described below is best for children around 2.5/3 years old but reading this silly book is fun for any age. What you need: a large piece of paper, letter stickers, crayons/markers. Draw a life size coconut tree. Color it together. Help your little match the letters in the book to the stickers and stick them on the coconut tree. This activity engages your child multi-dimensionally and working on a vertical surface encourages these skills. Talk about the letter and the sounds the letter corresponds with. You can also talk about familiar words that start with each letter. You can also build your own coconut tree with letter blocks! Start with "a" and work your way up! See how tall you can make it before it falls down! Post your pics on Instagram, tag with #LunchWithLittles and follow @lunchwithlittles! I have been bitten by the pumpkin bug. 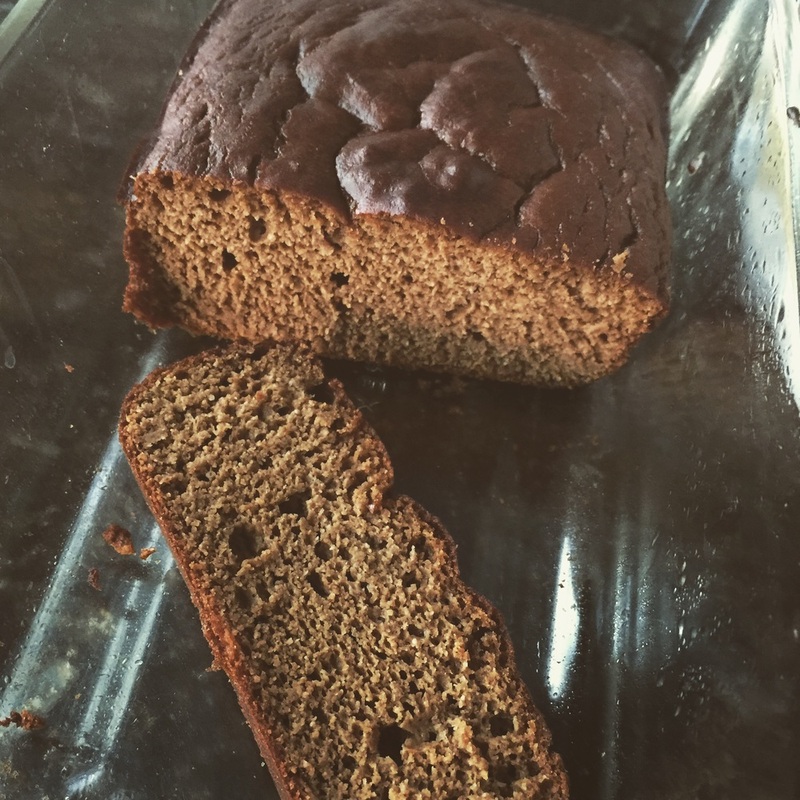 This gluten free paleo pumpkin bread (recipe from Elana's Pantry) has a great texture and tastes great. I am so glad I doubled the recipe and made two loaves, though it is a super quick and easy recipe to make again. Hope you enjoy it! I work with a lot of toddlers that eat, breathe and sleep for automobiles. This blog post is dedicated to the caregivers of a child who has identified his/her purpose in life as playing with cars, reading books about cars and watching cars drive past (or trains or trucks or buses, etc.). As caregivers, we try to embrace our children's' passions. It can get tedious and tiresome and frustrating if your child's vocabulary consists of only 3 words: "car, truck and choo choo". For many families, it can be difficult to expand said toddler's interests beyond these beloved vehicles. I have been digging deep into my creative tool box and will share some ideas that you can consider using to encourage your child to engage in "outside the box" play with these vehicles and ways you can incorporate some other concepts and vocabulary into your "things that go" play session. Every child is different and individual, so you can get creative with your play, adapt to your family interests and try different strategies with your toddler. You can expand on the words your child says by adding a word onto their utterance when you repeat back to them. If they say "car" you can say "that's a big car"
Model verbal sequences - "ready, set, go...", "up and down" - you can deliberately pause before saying the last word of a familiar sequence in an attempt to prompt the child to fill in the space and produce the word or sound, such as, "ready, set.....(pause)...go"
Reading books about cars, trucks and trains - one of my personal favorites is Richard Scarry's "Cars and Trucks and things that Go"
I found these car beads at a local consignment shop. Model action words during sensory play - trucks in sand, model "dig, scoop, dump, crash, lift..."
Silly play - tape or glue wheels onto everyday objects to make silly cars - banana car, crayon car, block car - pair with the Richard Scarry book I mentioned above! Click on this link to download a worksheet you can print to match cars and cut out wheels to tape onto household objects to make your own silly cars. Make a pop bead train. How do you incorporate cars into other areas of play or incorporate other concepts into your car play? Share your ideas in the comments. Please tag your photos #LunchWithLittles or share on my Facebook page. Nothing better on a rainy morning than a warm bowl of oatmeal. I know, my blog title is "Lunch with Littles" but oatmeal can be eaten any time of day. Set up a "bar" similar to a sundae bar or what you might see at your favorite FroYo place. Model self-statements: You can talk about what toppings you will put on top of your oatmeal. "I like raisins. I want bananas." Use short phrases with action words like, "scoop, mix, pour, sprinkle." Oatmeal with jam and almond butter. Please share your photos with hashtag #LunchWithLittles on Instagram. Hello there, Lunch with Littles readers! My name is Cassandra and I will be joining you for lunch today! Like Jennifer, I also work in Early Intervention. I am a behavior specialist and I specialize in difficult behaviors and developmental delays. Let’s talk lunch! Snack and meal times are a great opportunity to incorporate fun and language into your everyday life with your little. And to go against everything your mother ever told you, yes it is OK to play with your food! Pretend play may seem like just fun and games but it is actually an important piece of childhood development. Pretend play helps children develop their language and social skills, helps them learn to read social cues, and assists them in learning more about themselves. They learn how to interact with others and how to consider the perspective of other people. Pretend play can help take the fear out of experiences that can be scary or confusing (like going to the dentist or the doctor) and can make mundane, boring tasks more exciting (like going to the post office or the grocery store). There are lots of ways you can engage in pretend play with your little while making or eating snacks or meals. You can bring a favorite stuffed animal, doll, or toy into the kitchen with you when you’re eating your meal. By encouraging your little to ‘feed’ the toy works on a variety of skills. You can work on fine motor acuity by encouraging your little to use forks or spoons to pick up food and deliver it to the toy’s mouth. You can narrate for the toy and ‘tell’ your little s/he is hungry (silly voices earn you extra points!) and develop social skills by letting your little ‘attend to’ the toy’s needs. You can work on body part identification and function of body parts by playing around with where the food goes (while pointing to different parts on the toy and/or on your little ask “Do we eat with our ears? No! Do we eat with our noses? No! Do we eat with our knees? No!”). You can exercise your little's receptive language skills by lining up a few toys and asking your little to feed one at a time (“Time to feed Elmo! Great job. Now let’s feed the cow! Oh look Mr. Potato is hungry – let’s give him some snacks," or "Elmo wants the banana."). Make it a little harder by using multiple foods – you can ask your little to feed Elmo something red, one pretzel, two blueberries, etc. Without bringing extra ‘mouths’ to the table (aka toys), you can still work on pretend play in the kitchen. Greet your food and encourage your little to say hello or goodbye to fruits and veggies as you eat them. Pretend a piece of spaghetti is a snake and ‘hiss’ a hello. Make silly faces with ketchup, whipped cream, or sauce on your little’s plate (or arrange the food itself to make happy, sad, mad, or surprised faces and help your little identify and imitate the emotion). I hope you enjoyed these suggestions! What pretend play games do you like to use with your little? This post was written by Cassandra, edited by Jennifer.